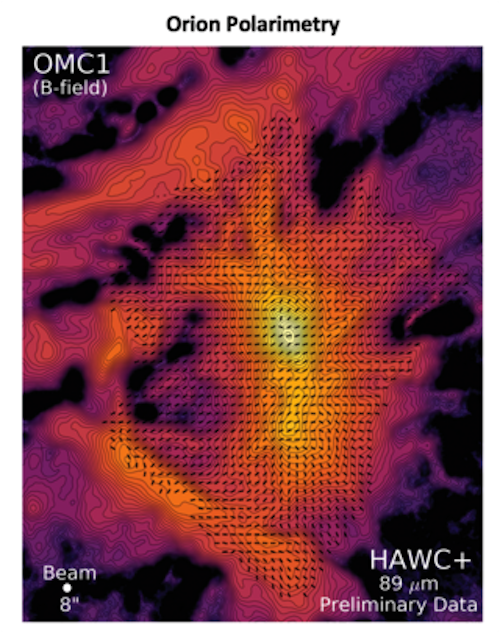 HAWC+ performed polarization measurements at 89 μm to capture the structure of the magnetic field in the Orion star forming region. Each line segment represents the orientation of the magnetic field at that location, overlaid on an image of the total intensity at the same wavelength. One such program will use the instrument to understand the impact magnetic fields have on stars forming inside a dark cloud, a stellar nursery filled with dust and molecules, called L1448. The HAWC+ instrument will also be used in a joint research program with the Atacama Large Millimeter/submillimeter Array to trace magnetic fields to better understand how planets form. Another program using the HAWC+ instrument will help astronomers better understand how energetic, active black holes contribute to the most luminous, distant galaxies. These observations will help them learn whether the luminosity of these active black holes is driven by star formation or accretion of material onto the central black hole. Researchers will continue to search for methane on Mars. SOFIA will conduct observations during the same Martian season that the Curiosity Rover previously detected the gas to better understand how methane levels change with the Red Planet’s seasons. Another team of researchers is planning to study comet 46P/Writanen as it passes close to the Earth, to search for clues in the comet’s dust that may help better understand the evolution of the early solar system. Researchers will create a large-scale map of the biggest star-forming region in the Large Magellanic Cloud, 30 Doradus, (also known as the Tarantula Nebula.) This map will be used as a template for understanding bursts of star formation that are the origin of a large part of the stars in all galaxies. The HAWC+ instrument will be onboard SOFIA for its first observations from the Southern Hemisphere, to study magnetic fields in star-forming regions and around black holes in the Large and Small Magellanic Clouds. Researchers will utilize SOFIA’s mobility to study the atmosphere of Saturn’s moon Titan by studying its shadow as it passes in front of a star during an eclipse-like event called an occultation. These occultation observations are part of an effort to monitor changes in Titan’s atmosphere over time now that the Cassini spacecraft's mission has ended. 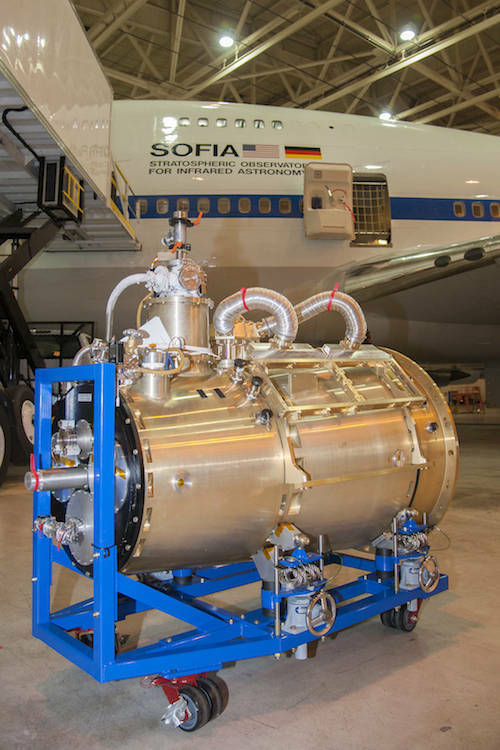 The newest instrument, an infrared camera called the High-resolution Airborne Wideband Camera-Plus (HAWC+), was installed on the Stratospheric Observatory for Infrared Astronomy, SOFIA, this week. This is the only currently operating astronomical camera that makes images using far-infrared light, allowing studies of low-temperature early stages of star and planet formation. HAWC+ includes a polarimeter, a device that measures the alignment of incoming light waves. With the polarimeter, HAWC+ can map magnetic fields in star forming regions and in the environment around the supermassive black hole at the center of the Milky Way galaxy. These new maps can reveal how the strength and direction of magnetic fields affect the rate at which interstellar clouds condense to form new stars. A team led by C. Darren Dowell at NASA’s Jet Propulsion Laboratory and including participants from more than a dozen institutions developed the instrument. SOFIA Science Center, NASA's Ames Research Center, Moffett Field, Calif.